In promoting the Year of Science, a province-wide initiative to engage British Columbians in science and understanding the importance of it, Ida Chong, the minister of science and universities and minister of regional economic and skills development, and Rob Howard, Richmond Centre MLA participated in a special science demonstration yesterday at Kwantlen Polytechnic University’s Richmond Campus. The demonstration was a preview to the university’s upcoming annual science fair, Kwantlen Science Challenge. Ida Chong, the minister of science and universities and minister of regional economic and skills development participates in a science demonstration to kick off the upcoming Kwantlen science fair. Chong and Howard took the hands-on approach yesterday as they helped science students from Kwantlen and Richmond based RC Palmer high school conduct a science experiment. Alongside the students, the minister and MLA gradually added weight to bridges made out of popsicle sticks to test their strength and breaking point. 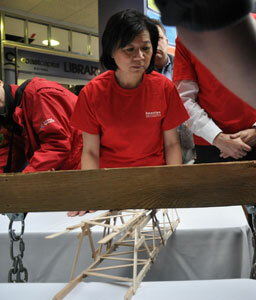 At the close of the experiment, Chong and Howard presented an award to the team that constructed the strongest bridge. Chong gave an inspiring speech to students on the importance of continued learning and how science is involved in their daily lives, even where they may not recognize it. She provided them with examples that they encounter on a daily basis, such as the internet, cell phones, clothing and food and how each was the result of science and technology. The official Kwantlen Science Challenge will take place from 8:30am to 3:30pm, Saturday, November 27. It is intended to cultivate students’ interest in science through inspiring and challenging lab exercises. Through this science competition, high school students are able to interact with Kwantlen’s facilities, faculty and lab staff to gain first-hand experience of science studies at a university-level. Kwantlen’s annual science fair is in support of the Year of Science, a province-wide and cross-government initiative implemented to engage British Columbians, in particular young people, in science by showcasing how science works, who scientists are, the kinds of work they do, and why science matters in the everyday lives of British Columbians and the communities they live in.